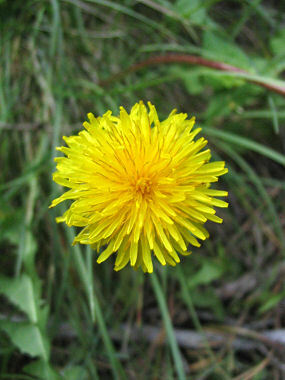 The Common Dandelion is a member of the Sunflower Family. The plant grows to 15 inches in height and has dark green lance shaped leaves that are deeply cut into triangular-shaped sections that grow around the base of the plant in a rosette to 10 inches in length. The weed typically grows along roadsides and in lawns, meadows and fields at elevations between 100 - 9000 feet. The Common Dandelion was intentionally introduced to the US from Europe by early settlers because of its value as a tonic. The leaves and root were also eaten and the flower made into wine. 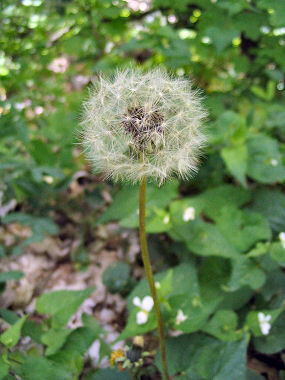 Dandelions blooms between April - September and produce a yellow, rayless flower, followed by a spherical, downy puff with seeds attached to parachute-like hairs.